The keynote panel focused on the issues and challenges raised by affordable housing creation and preservation in New York City. 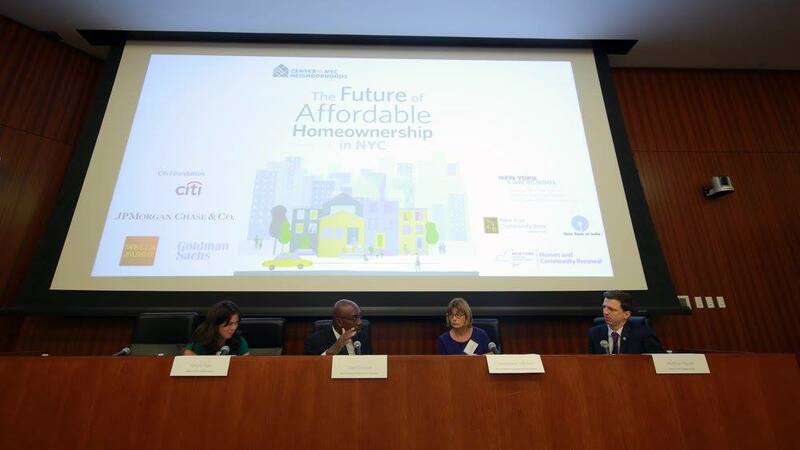 On September 30, 2015, the Center for NYC Neighborhoods held its conference on the Future of Affordable Homeownership in NYC. The event was hosted at New York Law School and sponsored by NYLS, JPMorgan Chase, Goldman Sachs, the Center for Real Estate Studies, the Center for New York City Law, and several other public and private institutions. The panel included Vicki Been, commissioner of the Department of Housing Preservation and Development, Colvin Grannum, president and CEO of Bedford Stuyvesant Restoration Corporation, Christie Peale, executive director of the Center for NYC Neighborhoods, and moderator Matthew Hassett, director of policy and communications at the Center for NYC Neighborhoods. Commissioner Been began the panel with talking points focused on the programs being implemented under Mayor Bill de Blasio’s affordable housing plan, “Housing New York: A Five-Borough, Ten-Year Plan,” that are specifically geared towards carrying out the plan’s commitment to targeting at least five percent of the new affordable housing units towards home ownership. Two of these programs are the New Infill Homeownership Opportunities Program and the Neighborhood Construction Program, or NIHOP and NCP, respectively. “We don’t have a lot of city-owned land left,” explained Commissioner Been, “and the land that we do have in many neighborhoods was pretty scattered…and just wasn’t being put to use.” NIHOP and NCP provide additional incentives to developers looking to build new housing in these areas by issuing Requests For Proposals for developers to bid on a cluster of locations in a neighborhood, which is a departure from the normal practice of issuing one RFP per property site. Commissioner Been also spoke about the programs implemented under the affordable housing plan that are geared towards ensuring that existing affordable housing units are sustainable for the present occupants to live in and for the City to use in the future. For example, the Green Housing Preservation Program helps home owners bring down their maintenance and utility fees by offering expertise on sustainable, energy-efficient upgrades and financial services needed by many to install these upgrades. Before the conclusion of the keynote panel, Commissioner Been revealed that, “for the first time, [the U.S. Department of Housing and Urban Development] is including neighborhood stabilization as one of its desired outcomes in dealing with distressed debt…so [HPD] with several local community partners has put together a proposal to HUD to acquire some of the distressed debt around the city and then try to use that to really stabilize those neighborhoods and stabilize those homes.” This proposal is just one of the many new HPD programs aimed towards making homeownership an accessible dream for New Yorkers of all income levels.